BlazerCon is a weekend conference to celebrate the dizzying growth of world football in the United States. deeply in love with the game. that has been "America's Sport of the Future since 1972." Now that future has come to pass. celebrities from the worlds of entertainment and US Sports. If you have been gripped by "the fever,"
There will be Football. There will be Beer. There will be Pies. "Soccer - America's sport of the future since 1972"
Rog and Davo believe that future has come at last. Their aim is nothing less than to enlighten the masses to the wildly entertaining world of soccer and the English Premier League in particular. Immersed in the high and low culture of the beautiful game, they mix analysis and guest appearances in equal measure, with the aim of providing an intelligent, often humorous, and always passionate soccer broadcast. 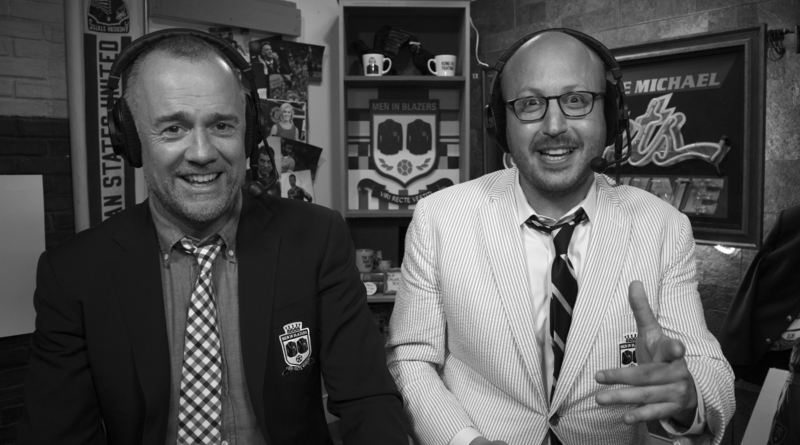 They created BlazerCon as a forum wherein the best global football minds could engage directly with an audience of American fans and GFOPs from across the nation who have fallen truly, madly, deeply in love with the game; a forum that would enable all involved to evade the traditional numbness of a FIFA International Break and collectively explore the rapidly changing face of the sport we all adore. Richard joined the Premier League - the most watched football league in the world - in 1999 where he is accountable for all elements of the league's operations including regulatory, legal and political matters as well as the sale of broadcasting and central commercial rights across 225 international markets. Under his leadership, the organization continues to use the strong platform provided by its 20 Member Clubs to successfully increase interest in the competition, grow revenues in the UK and internationally, and invest in and support football development at all levels of the sport. Richard is a Founding Trustee of the Football Foundation – a charity funded by the Premier League, The FA, and the UK Government - which has built over 500 football pitches for community use, and improved thousands of existing sports facilities across the UK. Roger Bennett & Michael Davies kick off the 1st Annual BlazerCon! US Men's National Team vs St. Vincent & the Grenadines. Featuring a Live Halftime Breakdown. The match will screen throughout the Con, so grab a pint and enjoy the game! Unleash the Food Trucks! Stop by for a Dub Pie, or sample a savory selection from Takumi Tacos, Sammy's Sliders, or Eddie's Pizza. Don't forget to check out the rest that BlazerCon has to offer! 4:00p - 5:30p Pie & Pints! The Guinness Beer Garden is open for a well-deserved pint! Grab a Guinness and a Dub Pie and take in the rest of BlazerCon. Evening programming starts up 5:30p, but the Beer Garden stays open from 4:00p - 9:00p. This two-day General Admission pass gains you access to all the panels, presentations, activations and evening shows that BlazerCon has to offer. Seating is on a first come, first served basis; best efforts will be made to accommodate everone's dream schedule, but panels run concurrently and seating is limited at some sessions. Fear not! There will always be something great to see! Upgrade your BlazerCon experience with Advanced Registration and guarantee yourself a prime seat at any panel you choose. Experience the action front-and-center from our Premium Reserved Seating sections - for panels and evening shows alike. PLUS, join Rog and Davo for a Sunday Pie Brunch on November 15th in the Crap part of Soho! DISCOUNT CODE to enter at time of purchase. *plus Credit Card and processing fees assessed at time of purchase. Traveling to New York for BlazerCon? BlazerCon rates on single and double rooms. Availability is limited so book early for best results! BlazerCon Group Rate while booking your room. Promotonal BlazerCon rates have been secured as a courtesy to our guests, but booking and all additional information should be pursued directly with the individual hotels found in the link below. Offer expires October 12, 2015. Travel, lodging, and local transportation is not provided by BlazerCon. Rates, availability, and cancellation policies vary from property to property. CLICK HERE FOR PARTICIPATING HOTELS!